A non-rested person has little capacity to live in Christ’s way. Like the first disciples, what many of us need is for Jesus to stand and still the storm (Mark 4:35–41). And like those first disciples, standing in awe of who he is and what he has done will change everything. Many live under the tyranny of the urgent resulting in a failure to tend to what’s important. For example, a blown-out tire is urgent, rotating your tires so they don’t blow out is important. On a more personal level, reacting to the needs around you is urgent. But proactively making space to reflect prayerfully on what needs to be paid attention to (whether personal or otherwise)—that’s important. How can we get to the place where it’s normal to tend to the important? It’s one thing to be physically tired—that comes from hard work. It’s another thing to be soul-tired. 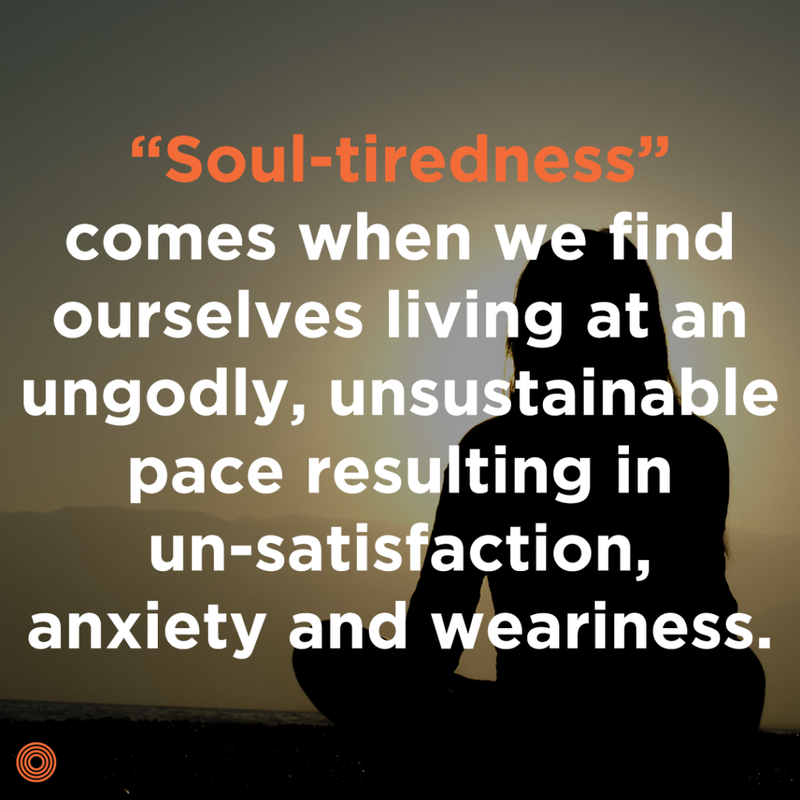 “Soul-tiredness” comes when we find ourselves living at an ungodly, unsustainable pace resulting in un-satisfaction, anxiety, and weariness. Having served as a pastor, church planter, and now a consultant in corporate America, I see soul-weariness everywhere. The story of Israel’s slavery in Egypt provides a backdrop to understand a culture of frantic productivity. As Israel groaned beneath Pharaoh’s unrealistic expectations, a messianic voice cut through the insanity, saying, “Let my people go!” (Exodus 5:1). Let them go from non-stop work, to a day off. Let them go from frantic productivity to time with God, family, and neighbors. Let them go from oppression to freedom. Let them go from from a life of anxiety into a place of trust in the Almighty God. It’s not surprising that Pharaoh didn’t recognize God’s voice; it was unfamiliar in every way. Pharaoh’s response revealed his heart as he pushed his slaves to work harder. That’s what you do when frantic productivity drives your system; you push harder despite the damage it will cause. In many ways, our culture reflects Pharaoh’s system. We have bosses demanding longer hours and commercials that promise apocalyptic satisfaction if we’ll buy the next greatest thing. We’re partly the victims of a society that works us to death, but if we’ll admit it, sometimes we willingly offer ourselves up in hopes that we’ll get ahead. I asked someone once how they were doing. “Busy, busy busy!” they responded. I wondered if they expected a high-five or if I should give them a coaching session on work/life balance. The sad thing is, many people answer this way, and it’s societally acceptable—in fact, we even commend it. The missional community life can even reflect this madness too. We think we have to always be producing, impressing, and expanding.  What if the life of a missional community wasn’t primarily about that? What if this shared life was simply about heart-change? As individuals, the implications of life under Pharaoh’s culture are enormous. With little time for God or neighbors, we become unapproachable and unsafe. Like Israel in Egypt, we reflect Pharaoh’s way, stuck in a mode of survival. But what if God’s way wasn’t about just surviving but thriving? What would that look like? God’s instruction that Israel take a day off each week gives a foreshadow of God’s solution (Exod. 20:10). The newly freed slaves needed a way to stay free from Pharaoh’s system so God commanded they rest on the seventh day of the week. Problem is, a day off isn’t a complete solution to a rested heart. For example, I met with an entrepreneur recently who has it made financially at the ripe old age of 34. He asked me, “Is this all there is? I need something better to do with my time. All I do is collect money.” He not only has one day off a week. He usually has seven, and he’s still not rested. Though this may not be your situation, the point is still the same. There’s got to be more to God’s rest than a day off, nap, and some leisure time. Here’s the good news—there is a rest waiting for you. This rest is bigger than a good night’s sleep, bigger than a day off, and bigger than financial security. This rest leads to an abundant life full of the right kind of work “to do the will of the one who sent me” (Jn. 4:32–34). The long-term discipleship life isn’t sustained on pure passion alone; it can only come when we make the space to be with Christ, rest, and listen. The way we rest indicates who we think is sovereign. Is God really on the throne? Does He have a plan I’m caught up in? The way we rest reflects what we believe about these questions. The same is true in the life of a missional community. Do we think we have to go all out all the time, or is there space simply to listen to each other and the Holy Spirit? The answer is YES! In fact, this is how effective mission begins. 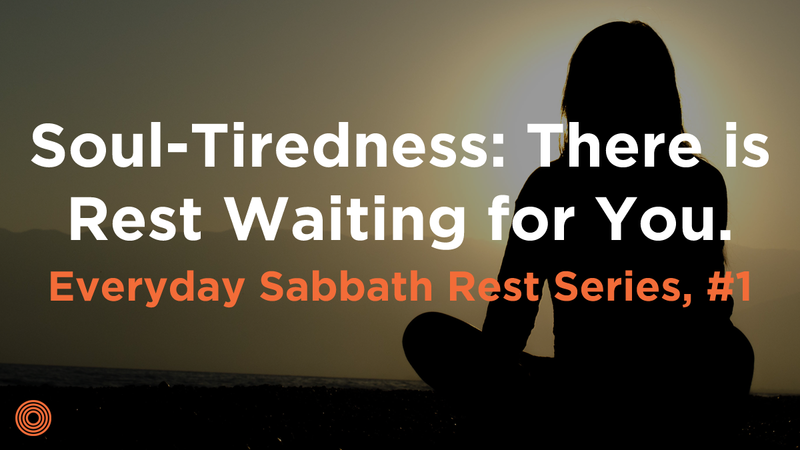 In my next two blogs, I want to unpack why rest is essential to God’s work of changing human hearts and second, how God’s rest is essential to a missional life. As a reader of this blog, you’re likely a Christian and desirous of greater faithfulness to Jesus. If that’s you, you probably know that a rested life doesn’t necessarily mean a life with a slower schedule. Instead, it means entering into a crazy world with a heart of peace and determination to engage more fully with the love of Christ, no matter what your schedule looks like. I look forward to the next few weeks as we explore the better rest God has planned for us. Are you resting in a way that indicates who is sovereign in your life?